Sometimes a politician emerges who resonates with voters because he or she is disarmingly frank and doesn’t couch every answer in political-speak. In marketing too, ads that are disarmingly honest can make a brand resonate with potential buyers. Now there is new evidence on the effects of ‘acknowledging a wart’. 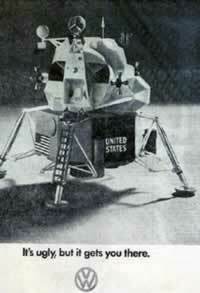 When we first landed on the moon, Volkswagen ran a brilliant ad depicting the moon-lander with the headline: “It's ugly, but it gets you there. VW”. In other words, it ‘acknowledges a wart’. That’s also how Avis became so successful with its classic slogan “We are no 2….We try harder”. By explicitly acknowledging that Avis was not market leader, it garnered credibility and trust for its positive claim that ‘Avis tries harder’. After all, underdogs usually do try harder. In an attempt to manage audience impressions, speakers acknowledge a negative and presumably hope to get more credibility for what they say next. Consciously or unconsciously, the intent of saying something like: “Now this may be a crazy idea, but …” is that the audience will be better disposed than if the speaker simply ignored or glossed over the possible negative. Yes. The evidence is that it does. It induces people to regard the speaker (and what is being said) in a more favorable light. It moderates people’s subsequent reaction. Research has long shown that presenting both sides of an argument, rather than just one, is more persuasive (unless the audience is already committed to your position). To acknowledge opposing arguments is to acknowledge a negative. It also connotes fairness and it helps to engender trust and credibility for the speaker. In his early work for Volkwagen, Bill Bernbach (founder of ad agency DDB) was a master of this strategy of gaining psychological advantage by ‘acknowledging a wart’. 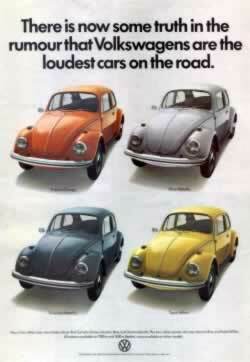 Acknowledging the VW brand’s ugliness was something that DDB deployed very effectively for Volkswagen. They even ran a ‘celebrity ad’ that starred the unattractive (but at the time, hugely popular) comedian, Marty Feldman under the headline “If he can make it so can VW”. At times VW also used this style of advertising as a linking device.1 For example, when Volkswagen introduced automatic transmission, it trumpeted the introduction of the automatic VW with the headline: “You’ve called it ugly. Now you can call it shiftless”. The phenomenal success of Volkswagen in those years was presumptive evidence that this strategy of ‘acknowledging warts’ is effective. Intuitively it feels as though it makes us more sympathetic and prepared to cut a brand a bit more slack. When a person acknowledged confusion in a paragraph that she had written, people rated the paragraph as ‘clearer’ than when she just glossed over or ignored the negative. Also, when a student explicitly acknowledged in a college application, his awareness that his grades were ‘less than stellar’, it resulted in more positive perception of those grades; his application was seen in a better light. Across three very different studies, the research consistently showed that the act of explicitly acknowledging a negative induced ‘audiences’ for these communications to discount the negative. In other words, they evaluated the negative attribute less negatively than they otherwise would. So, this strategy seems to be able to temper or offset otherwise unfavorable evaluations. I would go further and say that in advertising, it can help build more trust and credibility. Al Ries in his book “The Fall of Advertising and the Rise of PR” observed that public relations works better today than advertising because it engenders both attention and trust. 3 Advertising’s crisis of confidence, he says, is not only because it is losing its attention-getting ability but also because it can’t engender trust. Where are today’s Bernbachs? Why these days, is there so little advertising that acknowledges brand warts? It seems to have vanished. OK, advertising is supposed to be about puffery but in saying all nice things, advertising clearly struggles to win trust and credibility. Maybe it is time to rediscover the art of ‘acknowledging warts’. Brand warts are usually not hard to find. Any mild negative associated with a brand is a possible candidate. Take a look at those early Volkswagen ads for inspiration. The warts they communicated went beyond just the product’s ugliness. For example, check out this next ad. When the company launched a new range of VWs in bright new colors, they displayed these garish Volkswagens under the headline “There is now some truth in the rumor that Volkswagens are the loudest car on the road”. Personally, I don’t remember the VW as being particularly loud but the rear-engine was distinctive and it made a unique noise. Being different it penetrated people’s awareness and for Volkswagen this was a wart to acknowledge, not ignore. Nobody is perfect. Nor is any brand. Consumers can handle this. Imperfections are part of life and if managed the right way, blemishes can make a brand seem more real and genuine. Acknowledging warts may not be for everyone but when challenging an established market leader, it can be a savvy way to build trust and credibility in a brand; a way to profit from honest advertising. 1. Sutherland, M. (1996.). "To build a brand, use something old as a link to something new " Journal of Brand Management 3(5): 284-286. 2. Ward, A. and L. Brenner (2006). "Accentuate the Negative: The Positive Effects of Negative Acknowledgement." Psychological Science 17(11): 959-962. Download pdf copy of "Acknowledging a wart - Profiting from honest advertising - April 2007.pdf"